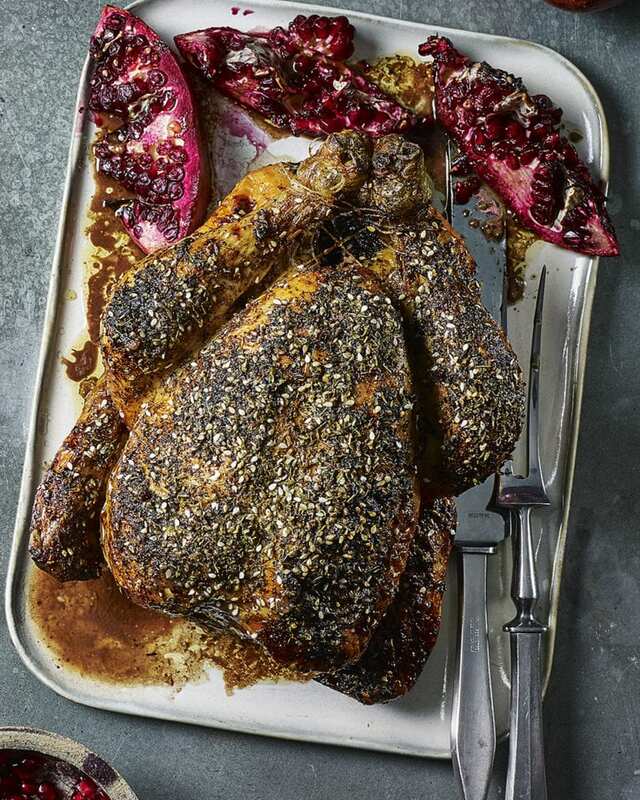 A chicken roasted in za’atar and pomegranate juice – served with a cucumber, radish and walnut salad – makes a surprising difference to your usual Sunday roast recipe. into the jug. Discard any pulp left in the sieve. the juice from one lemon half. Roast for 20 minutes. Mix the pomegranate juice with a good splash of water, then add to the roasting tin and roast the chicken for a further 55-65 minutes or until cooked through (a digital probe thermometer should read 72°C and the juices will run clear when you push a knife into the thickest part of the thigh). Meanwhile, put the red onion in a large serving bowl with the olive oil and the juice from the remaining lemon half. Season and toss to combine, then set aside. with pomegranate molasses and any juices from the tin, then sprinkle with sumac to serve. Add pomegranate wedges to the roasting tin with the chicken for an attractive garnish. They’ll also add a slightly bitter edge to the roasting tin juices. How to choose the best pomegranates: Generally, the pomegranates you see in the shops in the UK are the ruby red-skinned variety, but the skin colour can range from yellow/orange to deep purple. Choose blemish-free fruit that are firm to the touch and heavy for their size, which indicates plenty of juice-filled seed pods (known as arils). Pomegranates won’t ripen after harvesting but keep well in the fridge for a few weeks. This colourful dish needs a bright, crisp white – try a Spanish verdejo or a French picpoul de pinet.